Dopey experiment is actually a betting strategy created for fun rather than for making real money at a roulette table, especially considering the name 'dopey'. This strategy was described by a former Los Angeles Times editor Andres Martinez in his book "24/7". Of course, even though the Dopey experiment cannot be seen as a serious betting system, the player applying it doesn't necessarily have to lose. On the contrary, with a little bit of luck it may prove to be quite profitable. According to the strategy of Dopey experiment, the player must divide his or her bankroll into thirty five equal pieces. Each of these 35 units must be bet on the same certain number on the table layout 35 times in a row. 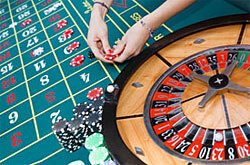 You may bet at random or even prove to be prone to roulette superstitions and bet on your 'lucky' number. In case some of the bets win during the game session, the player may be able to restore his or her original bankroll. It is especially satisfying to know that you are playing with the casino's money if you win the bet. And even if the player loses every single bet but one, he or she will be able to get the whole bankroll back by means of one winning straight bet. As it was already mentioned, the player who wins may choose to continue playing with the house money. Of course, the chances to win applying the Dopey experiment are quite low - there is about 60.7% probability that a certain number will come out during each of the consecutive spins. It is especially evident as the wheel actually has 37 slots (or even 38 in the American roulette) - we mean of course additional zero slots. The presence of these extra slots provides profit to the casino through the house advantage over the players which makes about 2.7% for European and about 5.2% for American roulette. This way, when a player makes a straight bet (a bet on a certain number on the table layout), his or her odds must make 36 to 1 or 37 to 1 (in American roulette). In fact, the payout for the bet that wins makes only 35 to 1. So, the Dopey experiment betting system, even although it cannot be considered a serious betting strategy, can still be very satisfying, especially if you enjoy the very process of the game and feel alright if you lose most of the time. It may turn that in 35 bets one will win and you will restore your bankroll.